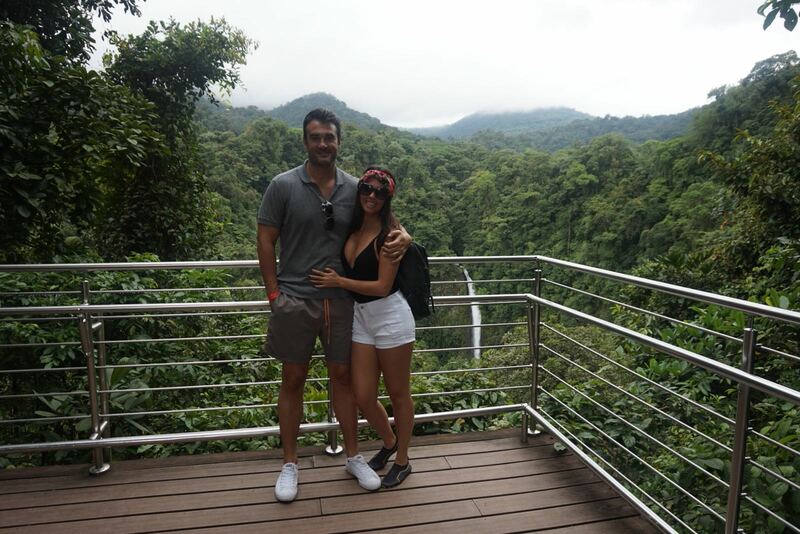 We drove at least 2.5 hours from the capital of Costa Rica (San José) to our destination, near the town of La Fortuna. The roads were good, with lots of curves and unparalleled views, and lush vegetation on both sides of the road. Once we saw the huge volcano, we knew we were close. 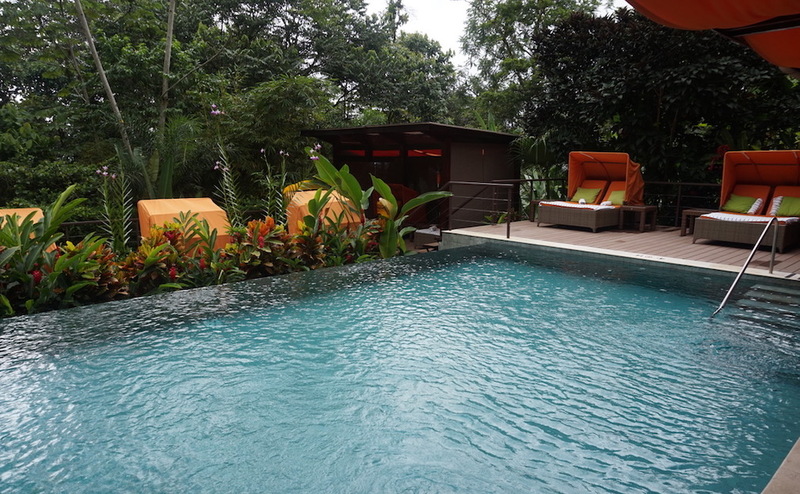 As we made our way into Nayara Springs, we began to realize that we had reached a tropical paradise. Right after getting out of our rental car, a hotel employee picked up our bags and took our car. Priscilla, the hostess, accompanied us to a lounge in the lobby where we were served cocktails and a local coffee as a welcome gesture. She informed us of everything we needed to know, gave us a map of the hotel and told us that our room had been upgraded and we had been assigned a villa (Villa V23). 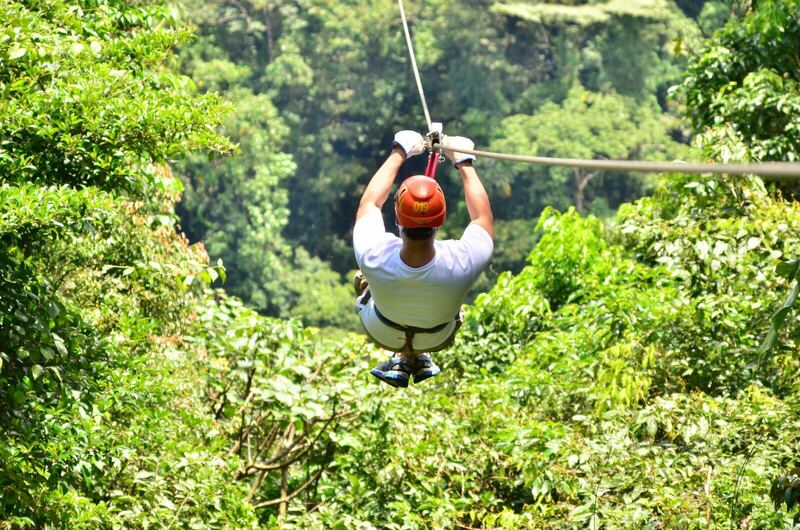 We took the time to book reservations for the excursions we had planned, which were zip-lining and rappelling. We were taken to the villa in a golf cart. This is the easiest way to get around the resort as it’s really big and the paths to the villas are pretty steep. You can really get everywhere walking, but if you don’t feel like it, all you have to do is call a golf cart and it will be there in literally 1-2 mins. When we entered the villa we were completely taken back, especially me. My girlfriend had asked them to decorate the room for my birthday and they had made everything beautiful. There were balloons everywhere, a beautiful decoration made of towels, flower petals, a bottle of champagne and a birthday cake. What a nice surprise! 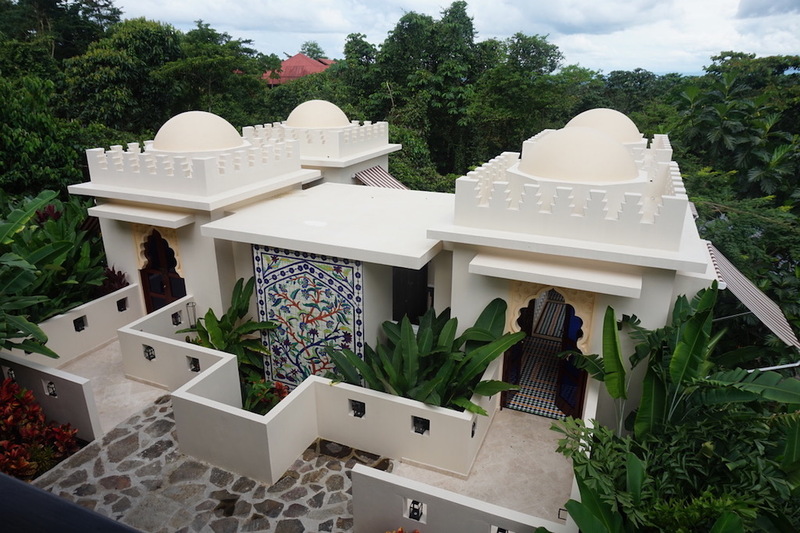 Our villa was huge with an Asian/African style décor and had a bedroom area and a living room with a TV where we were served local fruits, and in the back was the biggest hotel bathroom we had ever seen in our lives. The bathroom had two clearly separated areas, one for each of the two people staying in the room with their own sink, mirrors, etc. 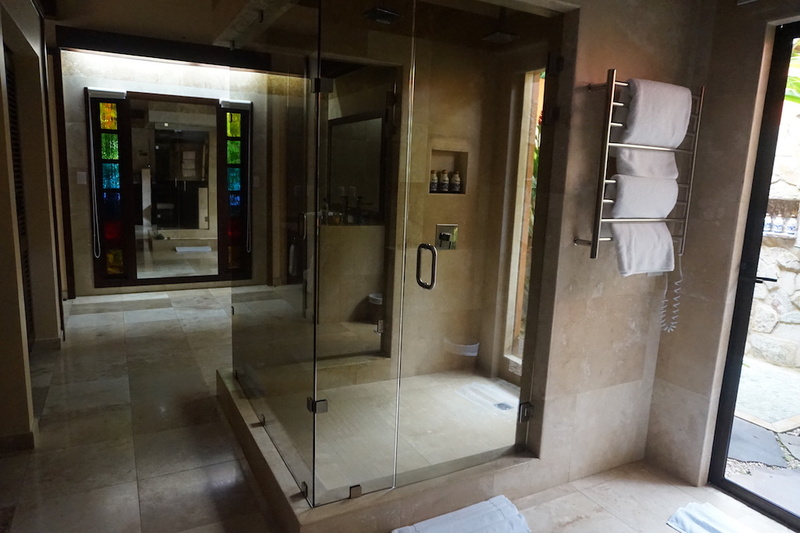 There was one indoor glass shower and another one outdoors that was covered with greenery, both double. There were also two nicely separated areas with wardrobes and a safe. The most impressive thing about the room was the terrace. It had a hammock, a dining table and an area with a bed to rest on and take your naps. It of course had a private pool surrounded by vegetation that worked like a Jacuzzi with its own jets, and most important of all, the water was hot since it was water from the hot springs that came down from the volcano. I think it goes without saying that before even unpacking our bags, we had jumped into the pool to get the full experience. We took a shower, enjoyed the birds singing, and then took a nap. When we woke up, we unpacked and got ready to go to the Asia Luna restaurant where we had a reservation. It’s an Asian restaurant with Thai-style food that also services sushi. The food and service are amazing. Our waiter Romeo was charming and upon overhearing us talk about the “soursop”, which we hadn’t eaten in a really long time, he offered to look for it the following day in town, although he warned us that it wasn’t in season. As we were still pretty tired from the trip, we decided to go back to the room and go to bed since the next day we had to get up early to go on our first adventure at Arenal Costa Rica. The next morning, we woke up to the sound of different animals. Honestly, the sounds were so weird that we didn’t know if they were birds, insects, mammals or what, but the sounds were nice. The hotel employees later told us that there are many frogs, birds and insects (cicadas) that make a lot of noise. The night before we had ordered room service for breakfast (included in the price), so a waiter arrived with our breakfast and placed it on the dining table on the terrace in front of the pool. The experience was wonderful, really enjoyable. We headed to the lobby where they would pick us up to go on our tour. While we waited, we went up the lobby stairs to the second floor, where they briefly explained to us how Nayara Springs makes its own coffee, and asked us if we wanted to attend a small course they were going to be giving that very afternoon. Our guide then arrived and took us to the area where we would be going zip-lining. We had a great time flying from one side of the mountains to the other, with the view of the great volcano in the background and monkeys in the treetops. An unforgettable experience. 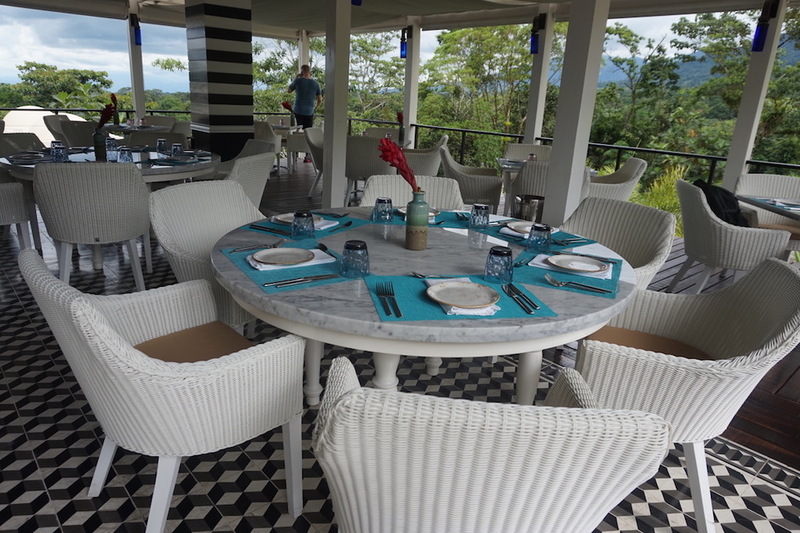 When the adventure was over, we were very tired and hungry so we decided to go back to the hotel and head to Altamira, another of Nayara Springs’ restaurants. We had the pleasure of meeting Johnny, the head of the hotel’s Sales and Commercial Department. Afterwards, we went back to our villa where we went for a swim in the pool and relaxed for a bit before heading to the Spa, where we had an appointment for massages. At around 5 o’clock in the afternoon we had our appointment. This was a “different” kind of experience unlike anything I’d seen before. 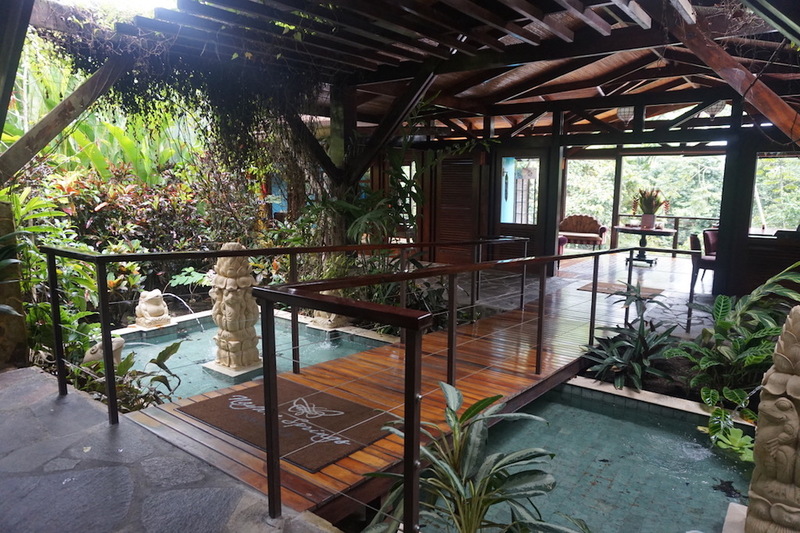 The spa is large and beautiful with unique yet exquisite décor that features a tropical rain forest theme, using lots of wood and earthy materials… very cozy. Once out of the changing rooms, we were taken to our treatment room, which was really unusual. 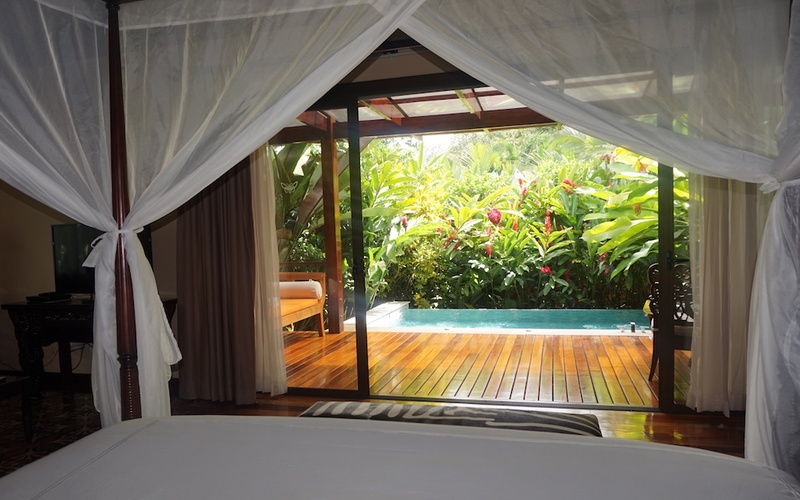 We each had a separate room, which were extremely spacious and open, and by that I mean that they were covered but one of the sides was completely open to the jungle. Basically, you were lying down and you could see the jungle in front of you, one meter away. We had never experienced anything like it, we could see trees and hear the birds and cicadas. It also just so happened that it started to rain as the sun began to set, where we got to see the light of day slowly fade away, little by little. Something out of a fairytale. The massages were excellent, I got a deep tissue massage and my girlfriend opted for a Swedish massage and facial. Right after that, we went to the villa to change for dinner at another of the hotel’s restaurants; Amor Loco. 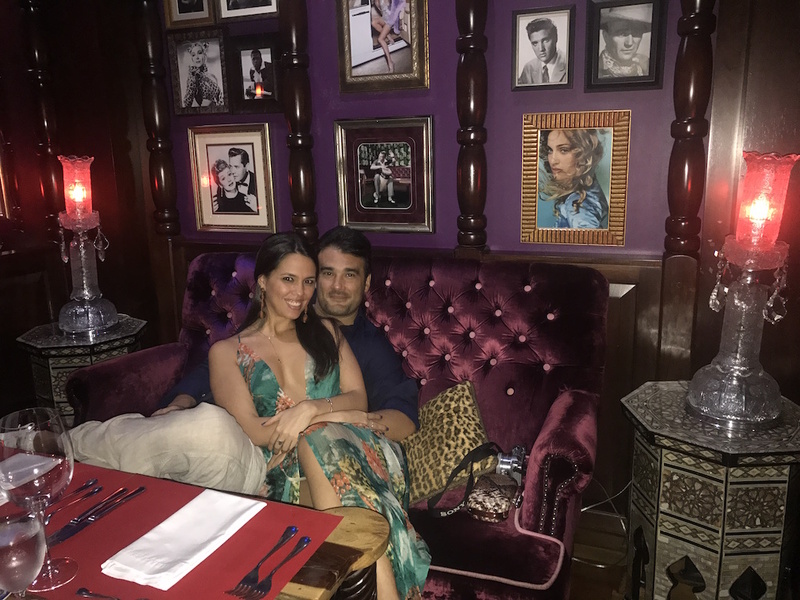 This is probably the most sophisticated restaurant in the hotel, with a very eclectic décor that fuses Asian, African-Moroccan and Indian decoration… it’s hard to identify where the décor really comes from, but that was our guess. It’s unlike anything you’ve ever seen before, however the combination is wonderful. The restaurant had a two-person band playing all kinds of songs, which was very nice. The food was excellent, and so was the service, and after dinner we looked at each other and said, “Let’s go back to the villa”. 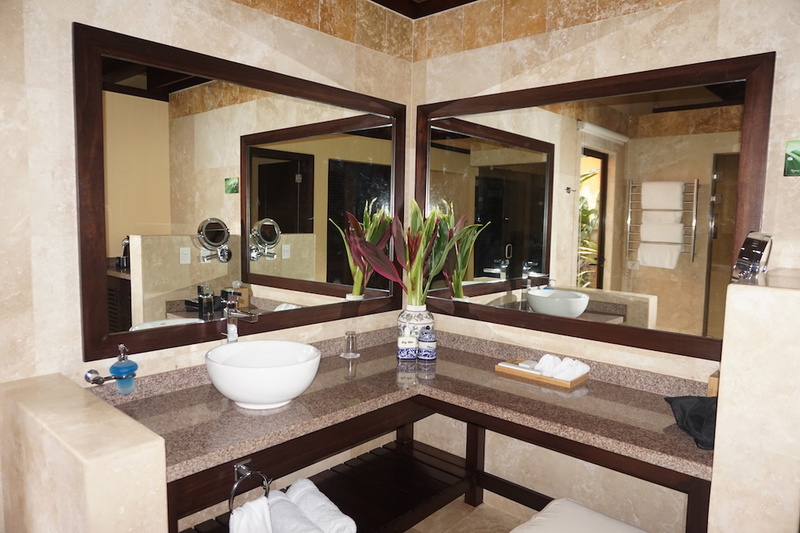 When you stay at Nayara Springs you quickly realize that you really don’t want to leave the hotel and practically the only thing you want to do is stay inside your villa resting and enjoying all of the luxuries and tranquility that it offers. The next morning, we decided not to have breakfast in our room and we went to Mis Amores. This is an a la carte restaurant (not a buffet), which has spectacular views of the hotel from above. We had a great breakfast (especially my fruit and vegetable juices) and headed to our new adventure, “Waterfall Rappelling”. As the hotel had organized our tours, we were picked up from the hotel lobby and taken to this activity. It was very close, about 20-30 mins by car. 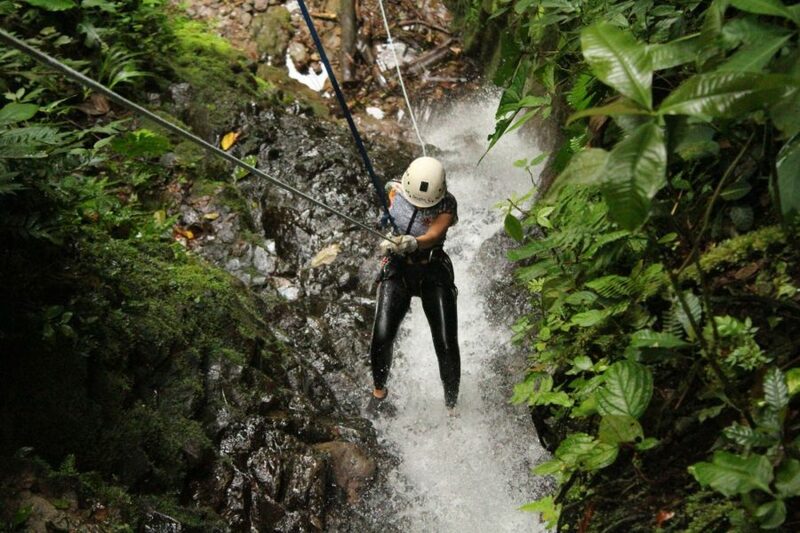 It was a lot of fun to climb down the waterfalls of the various streams and swim in the pools. We returned to the hotel at about 2 pm and stayed there all afternoon. My girlfriend fell asleep in the hammock on the terrace while I worked a little on my emails. When dinner time came around, we got ready and went to meet some friends for dinner outside the hotel. 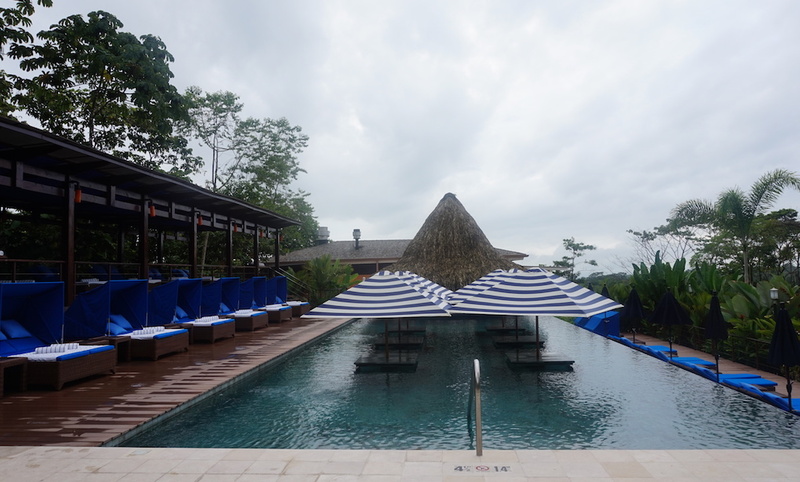 We must admit that Nayara Springs had us feeling spoiled, because the truth is that we weren’t satisfied with the service and food at the other place. The following morning, we decided to have breakfast at Altamira, the buffet restaurant. We really loved it because it offered a wide variety of fruits, pastries and different local foods. We ate our fruits, natural juices, oatmeal and of course, the best plate of huevos rancheros!! 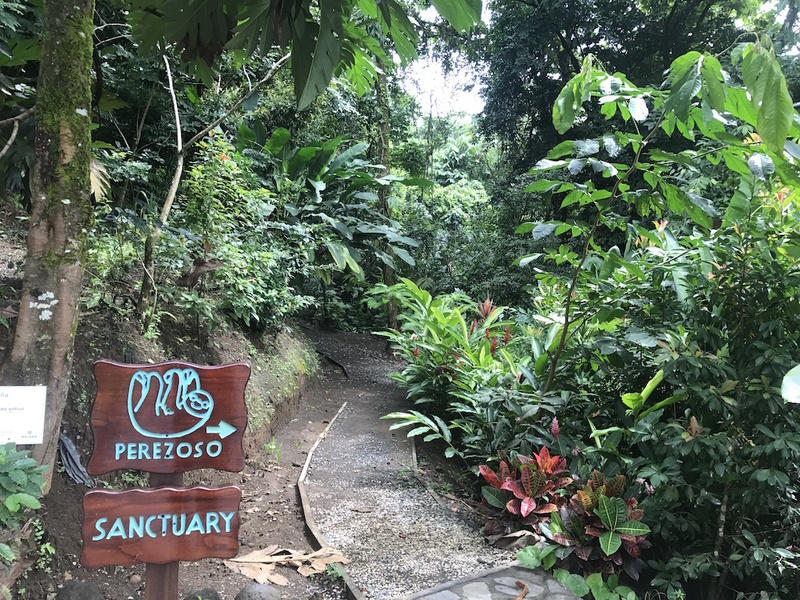 We then decided to take it easy that morning, going for a stroll through the “sloth sanctuary”, although unfortunately we didn’t get to see any. In the afternoon, we decided to go and see the Fortuna Waterfall. This place is highly recommended because you can swim and the experience is one-of-a-kind, but you have to be prepared to walk down and then back up lots and lots of stairs. When we got back to the hotel, we prepared to go have dinner again at the Asia Luna restaurant, and we were fortunate enough to have Romeo looking after us again. We decided to get the most out of our last day in this paradise, so we had breakfast in our room and walked around the hotel. We went back to the “sloth sanctuary”, and this time, thanks to Andrei (our cart driver), we saw one at the top of a tree. It was far away and tried to hide from us, but we were able to see him, which was really exciting. They explained that Nayara Springs is a place that specializes in giving sloths a home inside the hotel. Theoretically, there are lots of sloths in the area and inside the hotel (where they even have their own names), but we only saw one. Our adventure in Nayara Springs came to an end and it was time to go home. We were sorry that our visit was so short, but we were very grateful to have gotten to enjoy such a special a place like this, and we will definitely be coming back at some point. The Nr. 1 Luxury Hotel in the World 2016/17 by TripAdvisor and the Nr. 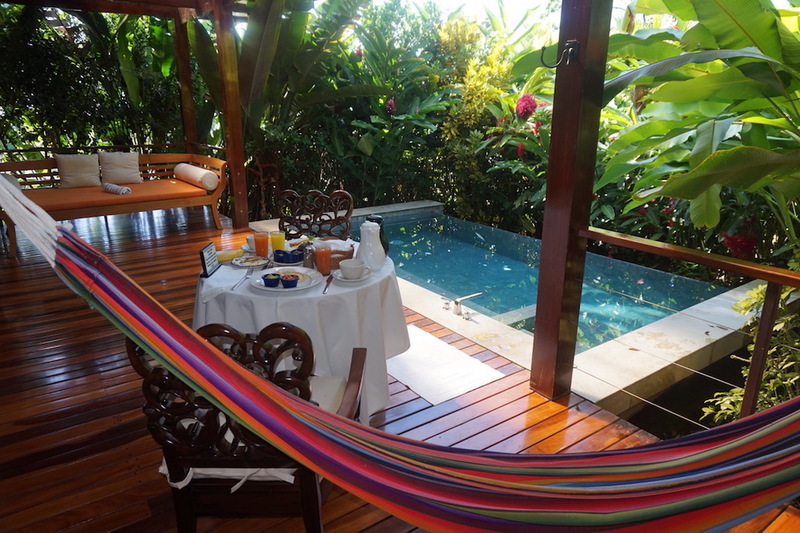 1 Resort in Central America 2016 by Travel & Leisure awards make a lot more sense to us now.